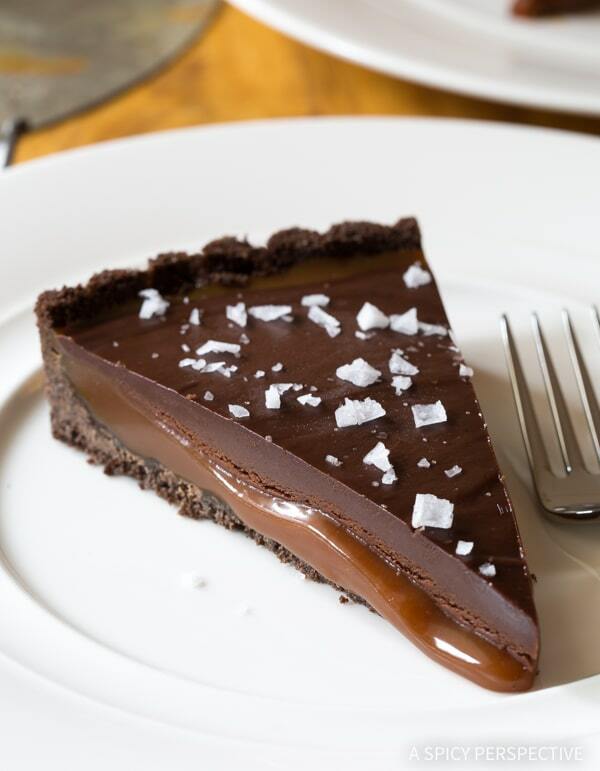 This amazingly divine Salted Caramel Chocolate Tart (Gluten Free!) is just the thing to make your sweetheart swoon this Valentines Day! Hello there chocolate and caramel lovers! I’ve got a little special something for you today… It’s called a Salted Caramel Chocolate Tart and it happens to be gluten free. This dangerously dark thing of beauty is the perfect treat to make for someone you want to impress. It’s elegant. Luxurious. Ultra rich, with deep salted caramel flavor and silky chocolate ganache covering the top. The crust is made out of gluten free chocolate graham crackers. 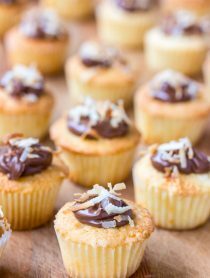 This provides a crisp crumbly contrast to the oozing salted caramel center that melts in your mouth. 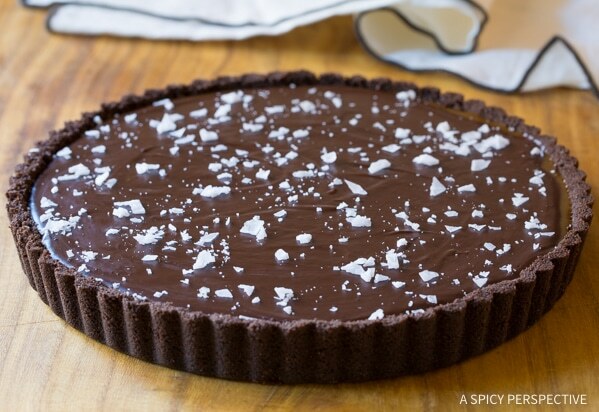 This Salted Caramel Chocolate Tart is to die for, you guys. We tried something similar not long ago at a restaurant, and I haven’t stopped thinking about it since. 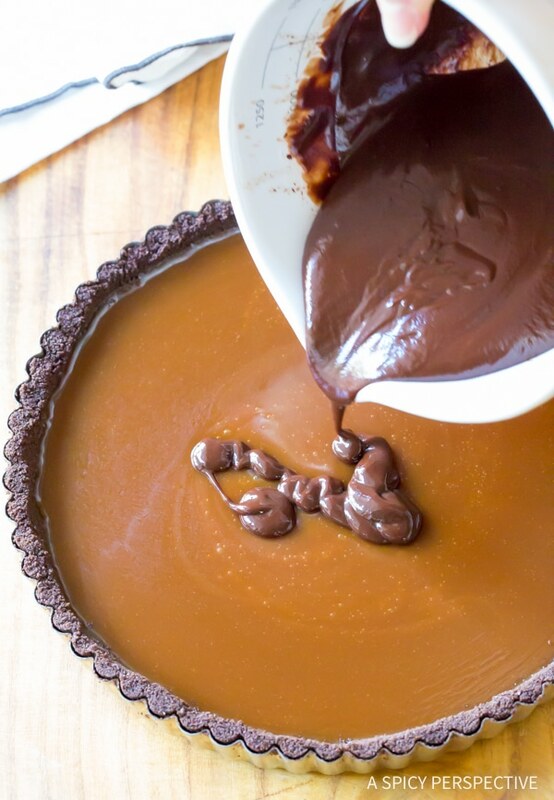 It’s easy to make your own Salted Caramel Chocolate Tart. You just need a food processor, a tart pan, and a little time on your hands. 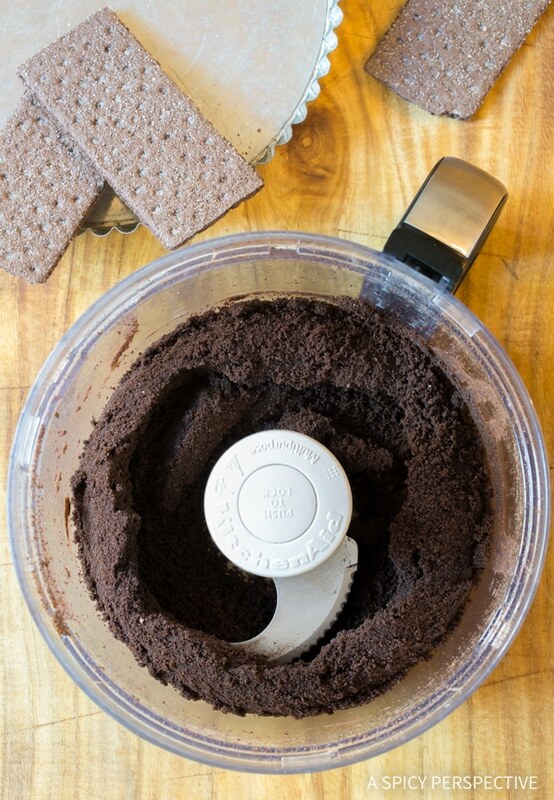 Start by making fine chocolate crumbs. 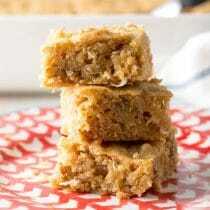 Crush gluten free chocolate graham crackers in the food processor, and mix the crumbs with butter. Press them into a tart pan and bake. Then boil sugar and water into a dark caramelized syrup. The color greatly effects the taste. So if you like mild caramel, boil the syrup for less time. However, if you like intensely dark caramel, boil the sugar until it’s dark brown. Whisk the caramelized syrup with cream and butter to make a thick caramel filling. Pour the filling in the baked crust. Finally, melt chocolate into cream for a smooth chocolate ganache. Pour the chocolate over the caramel filling and chill to set! See? You can do this! Our Gluten Free Salted Caramel Chocolate Tart is the perfect dessert for Valentines Day. It’s decadent and tastes, well… special. 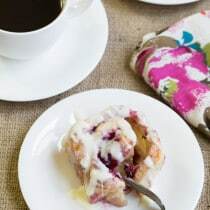 Your sweetie will feel special when they taste it, and that’s what a good dessert is all about! 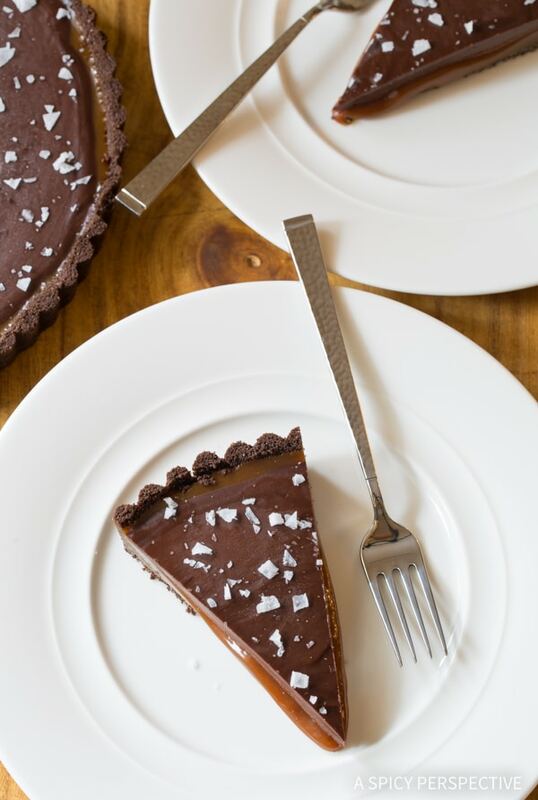 Salted Caramel Chocolate Tart (Gluten Free!) 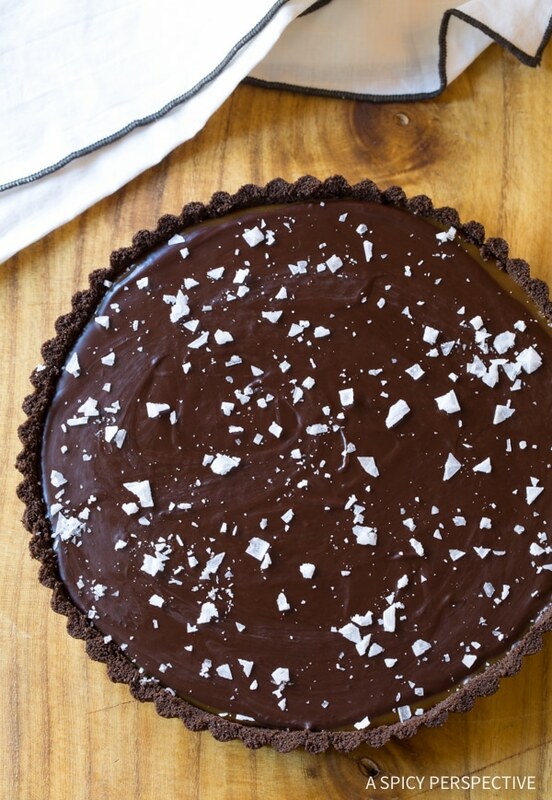 - This divine Chocolate Tart Recipe is made with a gluten free crust! Best dessert we've made all winter! Preheat the oven to 350 degrees F. Place the chocolate graham crackers in the food processor. Pulse the crackers into fine crumbs. Pour the melted butter into the food processor and pulse again until well combined. Press the chocolate crumbs, firmly and evenly, into a 9- or 10-inch tart pan. 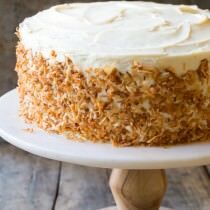 Make sure to press the crumbs up the sides. Bake for 10 minutes. While the sugar is boiling place the heavy cream, butter, vanilla, and salt in a microwave-safe bowl. Warm the ingredients for 1-2 minutes in the microwave, until the butter melts. Then stir well. (This can also be done on the stovetop.) Once the syrup is taken off the heat, quickly whisk the cream mixture into the caramelized syrup, until very smooth. 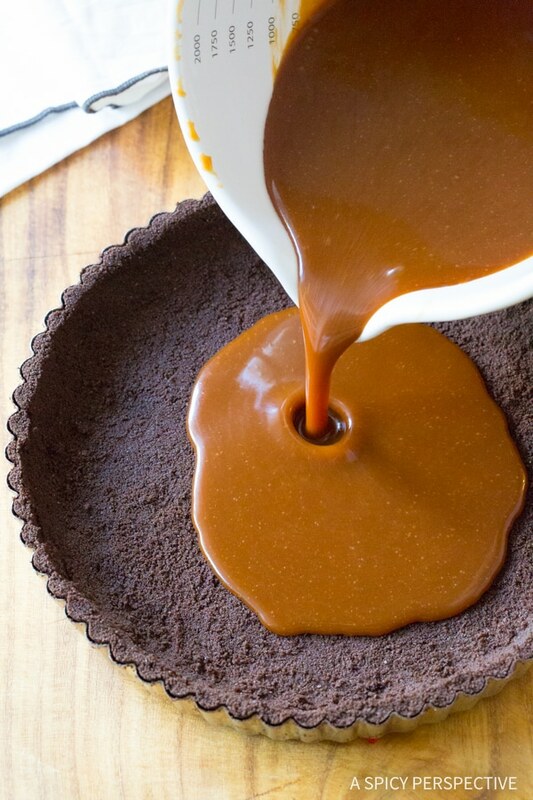 Pour the caramel filling into the baked tart crust. Tap it on the counter gently to remove bubbles. Then place the tart in the refrigerator to set. Allow at least 30 minutes of chill time, before adding the ganache layer. For the chocolate ganache, break the chocolate into pieces and place in a microwave-safe bowl. Pour the cream and corn syrup over the chocolate. Heat in the microwave, in one-minute increments, until the chocolate is melted and stirs smoothly into the cream. (This can also be done on the stovetop.) **The corn syrup is optional. It makes the ganache shiny, but is not necessary for flavor or texture. Pour the chocolate ganache evenly over the top of the caramel filling. Use a spatula to spread the chocolate to the edges. Place in the refrigerator and chill for at least one hour. Then sprinkle the top with salt flakes. You can keep the tart in the fridge. However for best cutting results, I like to keep the tart in the freezer. For neat edges, lift the tart out of the ring and cut the pieces while frozen. 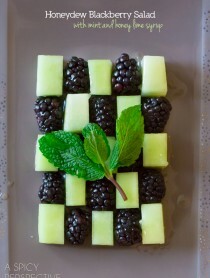 Thaw the pieces on dessert plates for 15 minutes before serving. 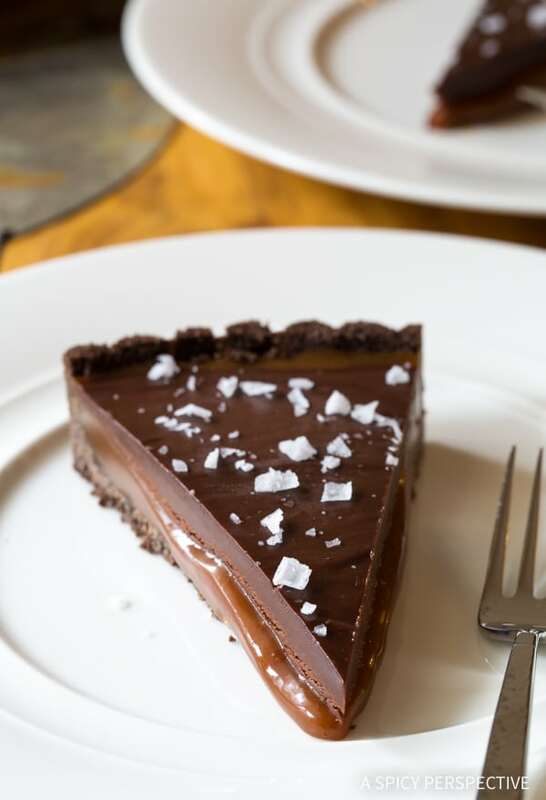 This Salted Caramel Chocolate Tart can be made up to a week in advance! NOTES: You can make this recipe using standard wheat-based chocolate graham crackers or wafer cookies. Yet to make it gluten-free, find gluten-free cookies or grahams. Pamela's makes a nice GF graham cracker. If you can't find them, you can also use Annie's GF chocolate bunny grahams, or GF Oreo-style cookies. Very rich and decadent, and it was impressive at my Christmas dinner. Gave it 4 instead of 5 stars because it melted into a shapeless mass after being left out for an hour, and it was really rather sweet and needed whipped cream on the side to balance the richness. Next time I may switch around the layers and proportions, having a thicker bottom layer of semi-sweet ganache and a thinner top layer of caramel. It would be less sweet and likely hold its shape better as well. 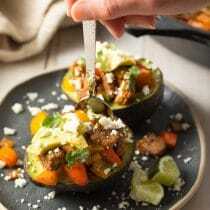 Thanks for this gorgeous recipe! This is the most wonderful gf dessert I’ve made . 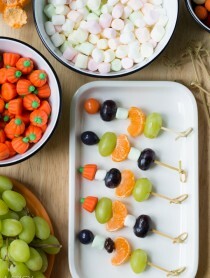 . . so easy and yummy, thank you! You mention using a candy thermometer, but you do not list the temperature that the boiling sugar should reach. Also, do you use the 1/2 cup of water to boil with the sugar? Aw man, that caramel. Seriously just made my mouth water! This looks like the perfect dessert! Hi Pierre! Yes, the caramel filling is made from scratch. That’s why you don’t see caramel in the ingredients list. It is made from the sugar, butter and cream. This look so decadent and beautiful! I love that you made it gluten free! I so need this chocolate and caramel tart in my life!